It is pretty depressing when getting initiated into an organized crime clan is the highest ambition two meatheads can aspire to. Unfortunately, it is all too attainable. The only price is whatever might be left of their souls. 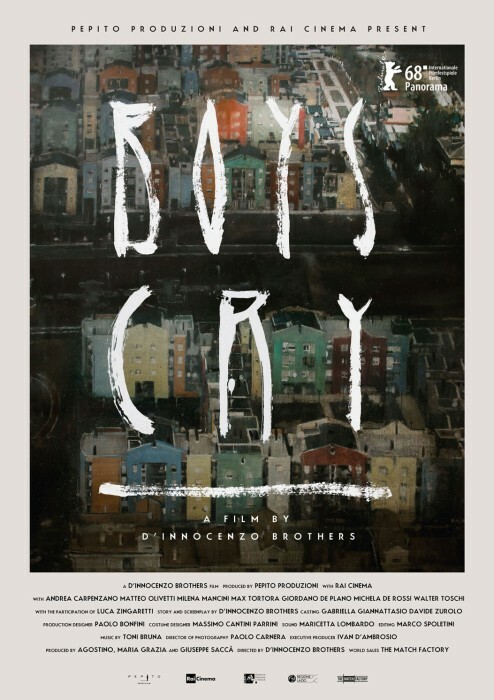 There will be money and hedonistic pleasures in the short term, but don’t count on much of a long run for Mirko and Manolo in the D’Innocenzo Brothers’ Boys Cry (trailer here), which screens during Open Roads: New Italian Cinema 2018. Even though they are enrolled in some kind of community college hotel-restaurant management program, Mirko and Manolo are not very serious about it. Their corner of Rome’s suburbs does not encourage optimism or long-term planning. They demonstrate why well enough on their own when they kill a stealthy pedestrian in a hit-and-run. Initially, they are panicked about potential repercussions, until Manolo’s wannabe-gangster father realizes this is a good thing. It turns out their victim was a snitch wanted by one of the local clans. Manolo’s father brokers his son’s apprenticeship with the clan, claiming he deliberately mowed the so-called “grass” down. Suddenly, Mirko is bent out of shape hearing Manolo taking credit for his negligent homicide. However, his friend quickly brings him into the fold, recruiting him to assist on what will be their first official hit. You can guess the general trajectory of their grubby lives from there, but it is especially harrowing to watch Mirko seeming lose all remaining vestiges of human decency. He will drive away his girlfriend Ambra (who was frankly out of his league) and his ailing mother. This is a gritty, grimy film, but its takeaway comes through loud and clear: even when there is substantial monetary renumeration, crime still doesn’t pay. It is a grim milieu, but Matteo Olivetti lights up the screen with his hostile intensity and barely contained energy. As Mirko, he steals the picture outright from Andrea Carpenzano’s more snide and reserved Manolo. Olivetti also has the benefit of playing scenes opposite Milena Mancini, who is quite a supportive co-star, while still being exquisitely tragic as his mother Alessia. It would be interesting to see them play mother and son again, but in a completely different context. This is a riveting movie, in a horrifying train-wreck kind of way. Shallow, kneejerk critics will probably be put off by the misogynistic and homophobic attitudes expressed by the two gangsters-in-training, but they are thugs. Everything they say and do is awful, almost by definition. The D’Innocenzos (Damiano & Fabio) water nothing down. This sure isn’t Bugsy Malone, but Mirko and Manolo really aren’t a heck of a lot older than that. Recommended for fans of the new wave of naturalistic gangster films (like Gomorrah and Salvo), Boys Cry screens Sunday (6/3) and Tuesday (6/5) at the Walter Reade as part of this year’s Open Roads.